February in Tucson means Gem Show! And this year, Ed and I attended. Over 40 events around town, with more than 50,000 people descending on the Old Pueblo to buy and sell unbelievable beauty! These pendants are made from Baltic amber that comes from Gdansk, Poland - just one of the many countries represented at this much-anticipated show. "In simple terms, amber is the surviving resin of ancient trees which over millions of years has been covered by sediment and compressed by rock movement and glaciers where chemical processes we are unable to comprehend take place. The result is a lump of rock that once cleaned of its opaque crust reveals an orangey stone that becomes the beautiful, sparkling gemstone once at the hand of an experienced craftsman. What is Baltic Amber and where does it come from? Baltic Gold, as it is often referred to, is particular in that it comes from the resin of coniferous forests that grew in this region over 40 million years ago although it is very difficult to date accurately. It has an acid content of 4-6% and can be found from as far north and west as the Danish islands to as far south and east as western Ukraine. It is worth remembering that while amber was formed at least 45 million years ago, the Baltic sea is only about 20,000 years old. The amber gets its name because the largest source can be found just to the east of Gdansk around the Kaliningrad enclave, and it is amber from this area which, with a northeast wind and a strong current, washes the pieces of amber onto the beaches of Gdansk. 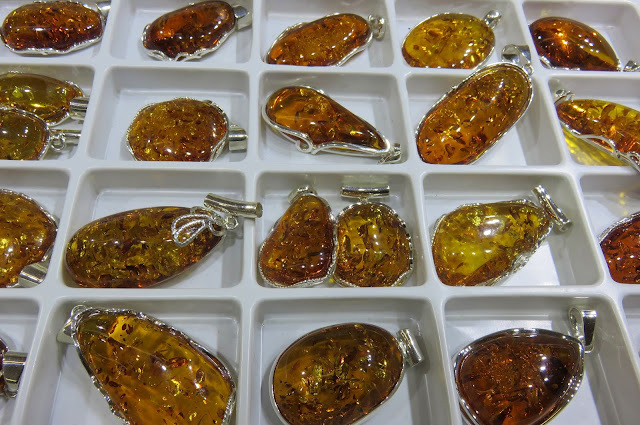 However, you’ll also find high-quality amber in other traditional amber trading cities in Poland such as Kalisz, Wroclaw and Krakow. Baltic Amber is generally sourced in one of two ways. It can be harvested from the beaches of the Baltic coast where, having been torn from the rocks at the bottom of the sea, is washed up onto the shore, where it is weathered by the sun and the wind. Alternatively, it can be mined from surface mines. Amber miners tender for the right to rent land into which they drill holes down to a level of between 6 and 12 metres. They then pump water down into the hole looking for the water to come back to the surface with a blue colouring which signifies it has come into contact with a pocket of amber. This is a high-risk business as the amber is present in crops of rock, not seams, so it is possible to check a whole area of land and find nothing while metres away is a huge isolated crop of amber."